Decorating for Christmas in the new house has been a fun and new experience for me and my daughter. 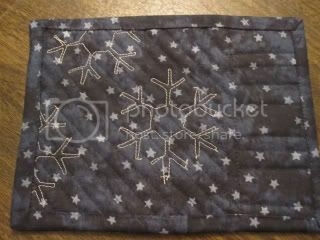 It also has given me new opportunities to add some quilting into the mix. Case in point. We have a credenza in our entryway. 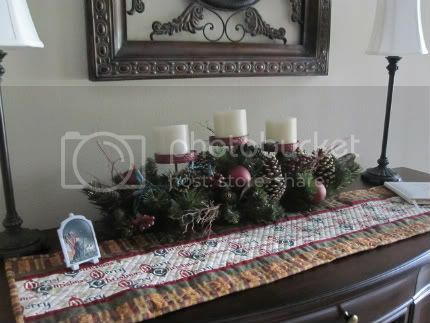 We needed a Christmas table runner. I pulled out one I started last year, but my daughter wrinkled up her nose and said "It doesn't look like Christmas!" Here is the way it looked to start with. Okay, DD was right. Nothing pizazzy about this. So let's try to rework the fabric. Cut the middle section out. And add something "Christmasy". 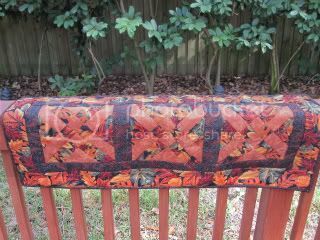 I even like the way the Free Motion Quilting added some swirlies to the runner. Now on to the tree skirt! I hope you are having fun decorating for Christmas. Would you believe that I am writing Christmas cards?? I figured I had better get them out early this year, as we have a new address that some on my Christmas card list may not be aware of since our move. Over the weekend I worked on this little landscape project. 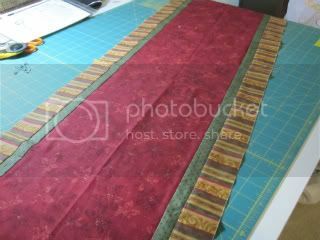 It is a fun wall hanging, and I hope to finish up the quilting to give it a little bit of dimension. So what have you been up to this weekend?? Will you be Cyber shopping today? Whewwww ............. what a day! Did you do it? Did you go out at 4:00 AM ??? If you did, you did not see me in the lines ;-) I was doing some zzzzzz's. At least until 7:00 when my sweet daughter tip toed into my room, fully dressed with keys in hand. I told her, WAIT, I can be ready in 15 minutes. So off we went, into the craziness of the day. Not with any grand plan, but just to enjoy the day together. Oh yes, we did find some Christmas presents, and a few fun things along the way as well. We actually came back home once, and unloaded the car (he, he), and headed in the other direction. So now that all the Sales are behind us, it's time to decorate the house, get the Christmas music playing and let the holidays gear up into full swing! As I've been reflecting on almost two years of blogging, there are so many avenues that continue to be sources of inspiration. 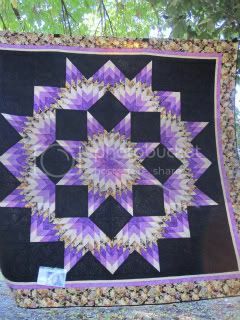 I LOVE to see the amazing quilting that so many of you share on your blogs. 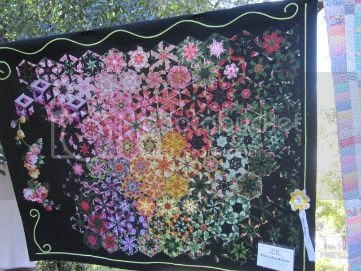 Quilters like Diane Gaudynski, Wendy Sheppard, and Patsy Thompson who share about their machine quilting techniques. 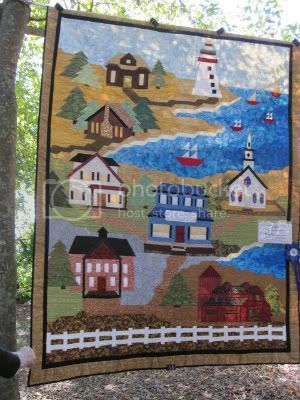 And then there is Judi Madsen, Mary at Quilt Hollow, and Natalia who are quilting artists! 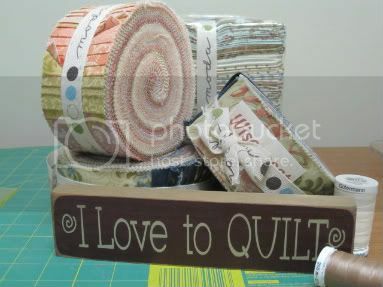 Does Crazy Mom Quilts and Stephanie make you want to jump up and start a project, right now! 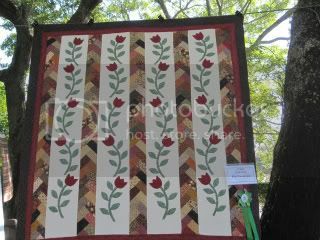 Amazing Hand Quilters like Crispy and Kaaren. There are also fun blogs that spike up with inspiration. Kelly at I Have A Notion and Madame Samm always bring a smile to my day. So tell me, what inspires you? Is it fabric? Or quilting. Do Designers give you the juice to go? Or do you grab your cuppa in the morning and read your morning Blogs to get your motor running?? Please be sure to sign up for my giveaway on yesterdays post! I love hearing from each of you. Yes my sweet peeps, the time has come. During this time of year, we think back on the things we are thankful for. I am very thankful for the many blessings that have come my way. And this year I have so much to be thankful for. After many years of debating whether to build or buy, we are grateful for the house the Lord directed us to. My family has been amazing as we moved to a new house, and then they cared for me when I had my fall. Blessings sometimes come is surprising ways. Walking through this adventure called life, we cross many paths. Two years ago I would never have thought about blogging. I'd been reading the Pioneer Woman, and one day it seemed like a fun idea to chronicle my quilting story. I never would have thought that I'd have enough to talk about, and actually have people (that's you guys) read my little blog. First off, Christie, Describe Happy was my 400th follower, so she will automatically be receiving a little prize. And here is the giveaway scoop. 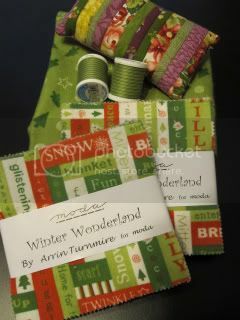 I'm offering for this giveaway two Charm Packs of Winter Wonderland by Arrin Turnmire, plus one yard of coordinating fabric. This is a flannel collection of fabric. Two spools of matching thread and a little Schnibbles pincushion that I made. I also may throw in a couple of other goodies as well. This giveaway will close on December 1st and winner will be drawn on the 2nd. I am counting each of you, my blogging friends, as a blessing to me. You make my life so much richer with your love for life, creativity and encouragement. Well, the holiday spirit has begun. I hope you enjoy this youtube! As the holidays are coming upon us, it is the season of giving. And there are several bloggy friend that are hosting giveaways this week. First up is the Faithful Quilter:Elaine's Journey hosting her second annual Thanksgiving give-a-way. And then there is beautiful Allie from Strandz . She's having a fabric giveaway of the cutest charm nature. And Aprons! Do you love Aprons? Head over to Goosegirl sews and check out her darling Christmas Apron giveaway. How about some Sweet Broderie? Check out retromummy for some sweet eye candy. And the biggie giveaway is another GO! over at Simply Solids. Now with the number of comments closing in on 500, there is little hope. But it only takes one number, right?? Whewww............ now that should keep you busy for a while. Brew up some coffee or a pot of tea and pay these bloggers a visit. 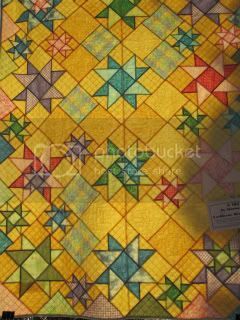 Have a great quilting weekend! Remember when we were told to take a One a Day vitamin?? Or how about "Bet you can't eat just one". Okay I am dating myself. 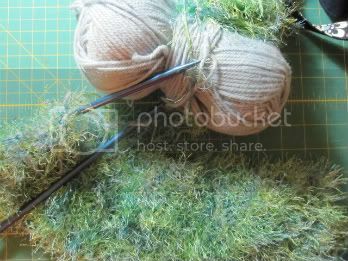 Well it seems like I am making a Mug Rug once a day. They sure are addicting. You can't get snowflakes any bigger then that! And I like the way the back looks too. So I guess this Mug Rug could be reversible. 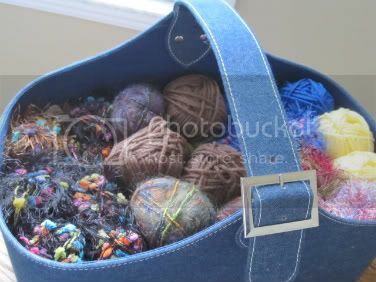 I am linking with Sew and Tell this week. 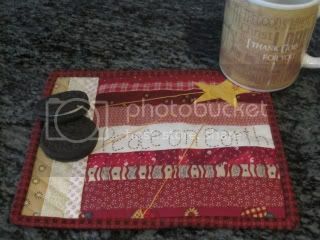 You all were so generous with your very sweet compliments about my first Mug Rug. I really don't think I have much original creativity. These little Mug Rugs are just too fun and are fast to do. 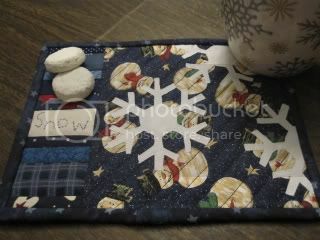 So tell me, will you be making any Mug Rugs this Christmas?? May your day be filled with Happy Quilting! I've not been sewing and quilting for 30 days, but for the last two weeks my sweet Bernina has been humming along. It feels good to work on projects. Many of which were left hanging three months ago. And today I finished this tablerunner. Do you you recognize the blocks? They are Anita's Arrowhead. 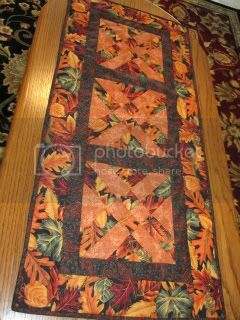 It was fun working this block into a Fall tablerunner. I did rip out the border twice, as I was not happy with the way it was going. But I think it will make a nice gift for a friend of mine. Keep that needle going up and down and enjoy a happy quilting day! 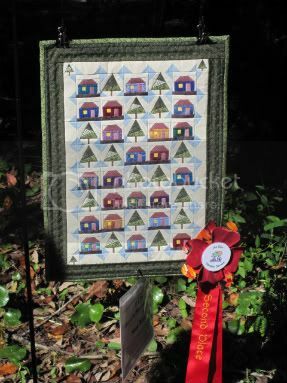 SewCalGal is hosting a Christmas Quilt Show this week. 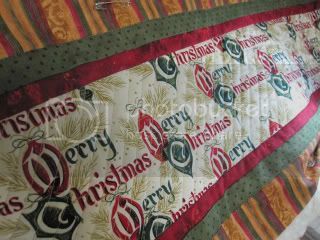 What a wonderful way to showcase Christmas quilts. 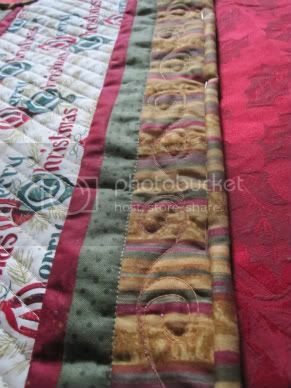 If you would like to participate, write a blog post about one or more of your Christmas quilts and submit it to SewCalGal's linky by November 21st. I've worked on a few Christmas projects through the years, but this quilt has always been one of my favorites. It's not finished, as I never had a large enough place to display this quilt. But since we have moved, I would love to finish it up and display it on one of the walls. Once the borders are sewn on it should measure approximately 60" x 70". 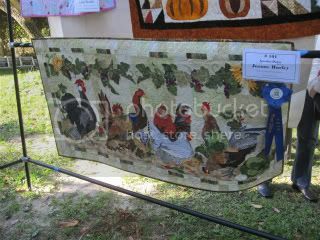 Thanks again to SewCalGal for hosting this Quilt show! Have a happy quilting day. 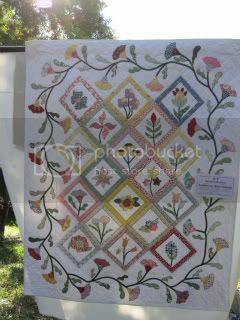 Madame Samm of Sew I Quilt and Jodi from Pleasant Home have been busy gals. They have been making coasters, or more correctly termed Mug Rugs! What inspiration and creativity! I really struggle with the creative part. I can take a pattern and go from there, but to pull something out of my head and make it happen with my fingers, well, that just doesn't happen. But I gave it the ole' college try and this is my Mug Rug. With several left over blocks from my string quilt, adding a cup of enormous proportions (we like coffee here), I put this little Mug Rug together. My daughter had a mug with appropriate colors, and the cookies were added for staging :-) How fun is that? I hope you have a great weekend! And Happy Quilting! 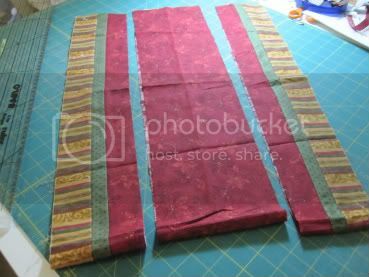 Linking up with Quiltstory: Fabric Tuesday. Remember this quilt I was working on?? There were several comments asking about this pattern. 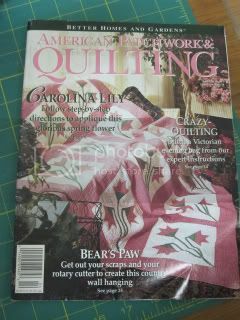 I knew it was from a magazine, and I suspected it was from American Patchwork & Quilting. Well last night I started going through my healthy collection of AP&Q, and I found it! The pattern was in this issue (April 1994). 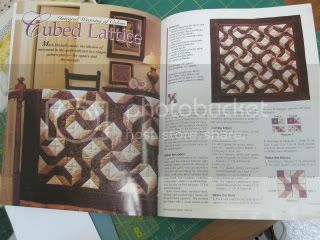 It's called Cubed Lattice by Marti Michell. As you can see it is a 60" square, but there were further directions on making the quilt larger. I am thinking I will add another section to lengthen the size. And last night I was having fun working on the Accidental Landscape. My sweet friend Kelly from I Have a Notion (you all know Kelly. She is the beautiful redhead that takes you on such fun adventures touring Quilt Market), sent this to me when I was still recovering from my fall. 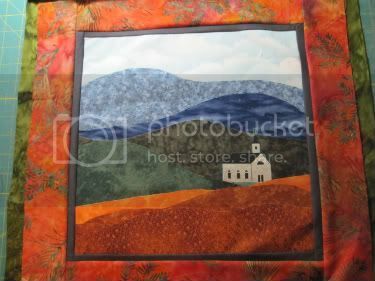 I found the church on a piece of scenic fabric and it works great for this project! 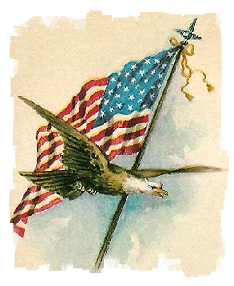 In the aftermath of World War II and the Korean War, Armistice Day became Veterans Day, a holiday dedicated to American veterans of all wars. On this Veteran's Day I hope we will all take a moment to honor and remember the men and women who have served, and those who continue to serve to keep our country free. 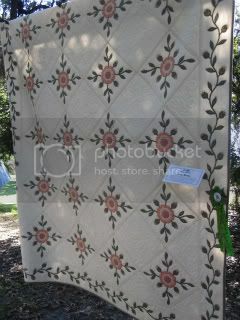 Did you know that 14% of all households report at least one family member who quilts? The average dedicated quilter is 62 years old with a college education and in a median household income of more than $90,000. The majority have a room in their home dedicated to quilting and/or sewing and spends an average of 2.2 hours a week on quilting websites. 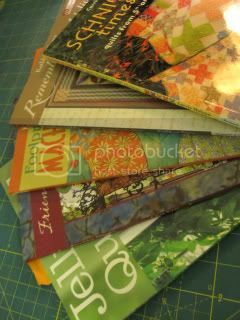 She also subscribes to 4 quilting magazines and spends 5 hours a month reading these magazines. 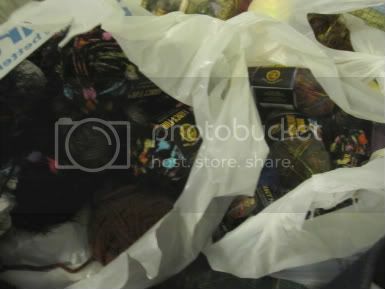 She has purchased an average of 95 yards of fabric and bought 5 quilting books over the past year. So how do you line up with these statistics? 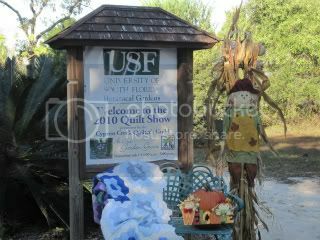 Enjoying a cool morning in Florida gave us a perk to visit the Botanical Gardens where the Quilt show was being displayed. 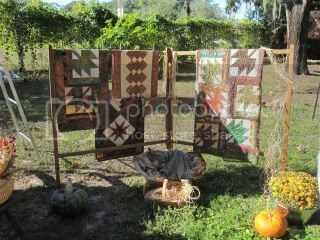 Here are a few more quilts of various styles we enjoyed on Saturday. 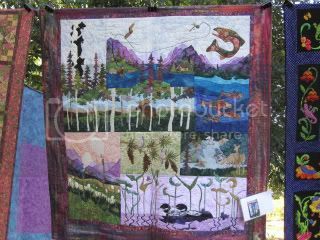 This next one was an incredible quilt. We loved the whole scene and the work was beautifully done. 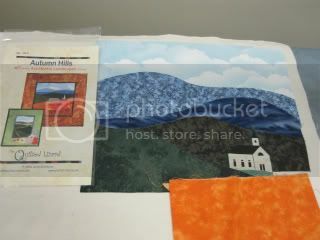 Isn't it fun to take a virtual quilt tour?? 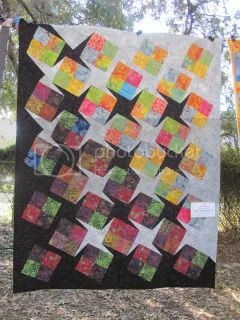 Now before I close this post, you need to stop by the Quiltmaker's blog and hop along as they introduce the second edition of 100 Blocks. Quilty Pleasures is having giveaways and lots of fun things to share. 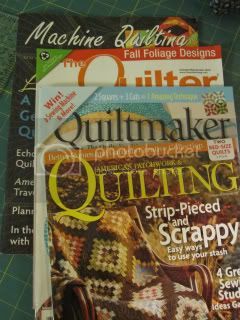 Remember this is where I discovered the Arrowhead block which was published in their current issue of Quiltmaker. So enjoy the fun. 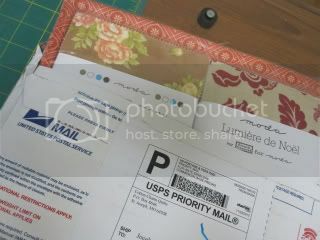 I am using Photobucket for the first time to upload my pictures. I'm learning as I go. So many bloggers have experienced trouble with their pictures lately. This seemed like a wonderful opportunity to try loading my pictures from an outside source. I'm planning on sharing these lovely quilts over the next few days. Stitchbird is giving away some cool Heather Ross fabric. Lavender Ridge is giving away a GO! Blushing Rose is having a month of giveaways! 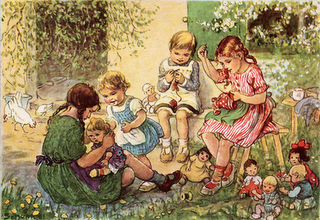 Stray Stitches is celebrating her 80th post. Summer in the City giveaway. 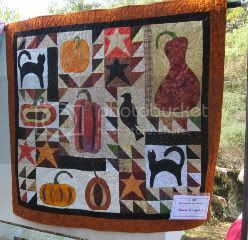 Stop by Leona's Quilting Adventure and check out her giveaway. For the first time in a very long time, the sewing buddies got together for a day of fabric, fellowship, food and fun! I really can't remember how long it has been since we have all sewn together, but today was good. Very good. One of the gals that sews with us is a fabulous hand quilter. It is a P3 Design. Yep, it was a good day indeed!